LES MISÉRABLES, the world's longest running musical produced by Cameron Mackintosh, continues its astounding success into its 34th year, confounding the British critics who dismissed it when it first opened. The acclaimed new production was created for the show's 25th Anniversary in the UK in 2009 and has gone on to enjoy huge success around the world all over again, including returning to Broadway. The New touring production which has just opened to rave reviews in Dublin has already taken a record-breaking advance of over £30 million with most dates sold out until January 2020, including Edinburgh, Manchester, Birmingham, Cardiff and Plymouth. There are just a few seats remaining in Milton Keynes, Bradford, Newcastle and Liverpool. Southampton goes on sale early in February and details of further UK and European dates will be announced shortly. 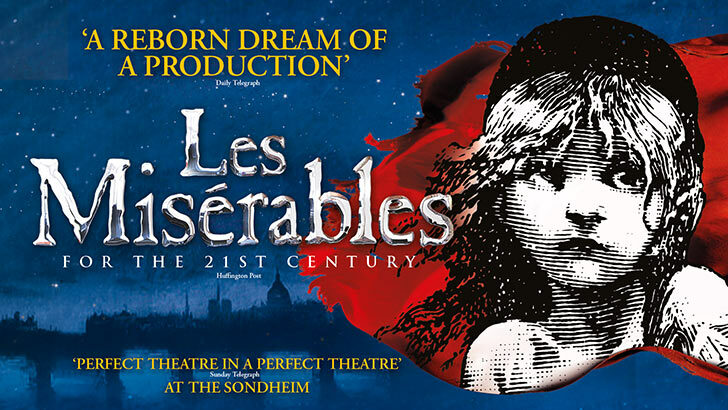 The Original 1985 production of LES MISÉRABLES can now only be seen at the Queen’s Theatre, London where it continues its record-breaking run, still playing to 95% capacity and nightly standing ovations. It previously played at the Barbican and Palace Theatres. The recent Christmas weeks broke all box office records at the Queen's. The Original London production at the Queen’s Theatre will play until 13th July 2019. The theatre will then close for four months of rebuilding work both backstage and in the auditorium as well as adding many much-needed new lavatories to the front of house. This work will restore architect W.G. Sprague’s original boxes and loges which, along with the entire front of house, were destroyed by a bomb in 1940 and caused the theatre to be closed for 20 years. In America, the current tour of the New production, which is playing major cities across the US and Canada until 2021, continues to play to 95% attendance and has grossed over $250million at the box office to date. Cameron Mackintosh said "I am continually amazed that LES MIS in its fourth decade continues to break new ground and new records. The show’s astonishing success is tribute to the story’s power to move and inspire which is at the heart of both the original novel and the musical. Tomorrow will always come for LES MIS!" Victor Hugo would have been amused by the social media storm created by the BBC's “song-free” adaptation of the novel and thrilled that when NOTRE DAME DE PARIS, the musical version of The Hunchback of Notre-Dame returns to London later this month at the Coliseum (frequent home to his other much revived musical hit RIGOLETTO), he will have two musicals running in the West End!